All transactions are safe and secure with a reliable history in online purchasing behind each of our associates. 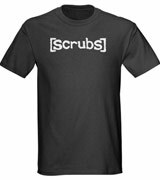 Buy the Scrubs Logo t-shirt to own Scrubs clothing and merchandise. The popular tee on the left features the logo for the NBC Scrubs TV show. The logo is displayed on the front of the shirt across the chest. This design can be purchased on both men's and women's style apparel in a variety of colors. These Scrubs t-shirts are the perfect gift for anyone who's a fan of the TV series. Browse through to see this Scrubs logo design on hoodie sweatshirts, long sleeve jerseys, ringer Ts, tank tops, hats and mugs. In addition to the Scrubs Logo tee above, browse the Scrubs Clothing Gallery for more apparel like men's and women's clothes, kids shirts or hoodies.